A large enterprise (the Customer) has an existing international WAN backbone using BGP as the routing protocol. They plan to replace a regional access network with DMVPN-based solution and want to extend the existing BGP routing protocol into the access network to be able to scale the access network to several thousand sites. 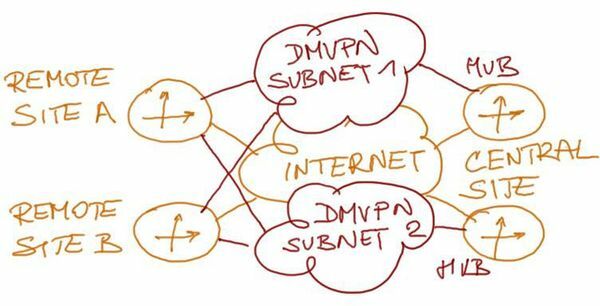 The initial DMVPN access network should offer hub-and-spoke connectivity, with any-to-any traffic implemented at a later stage. Should they use Internal BGP (IBGP) or External BGP (EBGP) in the DMVPN access network? What autonomous system (AS) numbers should they use on remote (spoke) sites if they decide to use EBGP in the DMVPN access network? The existing WAN network is already using BGP routing protocol to improve the overall scalability of the network. The WAN backbone is implemented as a single autonomous system using the Customer’s public AS number. 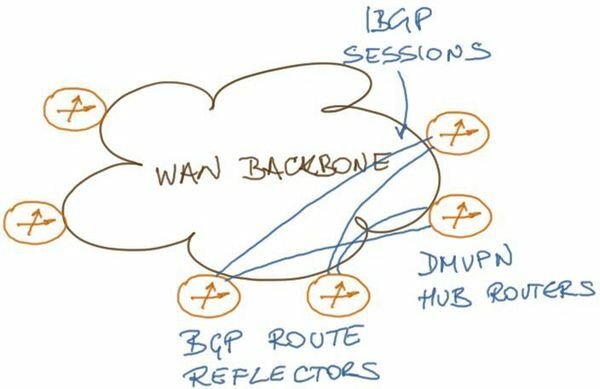 IBGP sessions within the WAN backbone are established between loopback interfaces and the Customer is using OSPF is exchange reachability information within the WAN backbone (non-backbone routes are transported in BGP). The WAN backbone AS is using BGP route reflectors; new DMVPN hub routers will be added as route reflector clients to existing BGP topology. Use EBGP in DMVPN access network.